Researchers from the Event Horizon Telescope (EHT), one of whom is Goethe University astrophysicist Luciano Rezzolla, announced a breakthrough today in several coordinated international press conferences: they have successfully captured the first direct visual evidence of a supermassive black hole. It is located at the centre of the neighbouring galaxy M87. The Event Horizon Telescope (EHT) operates a planet-scale array of eight ground-based radio telescopes that are linked together. 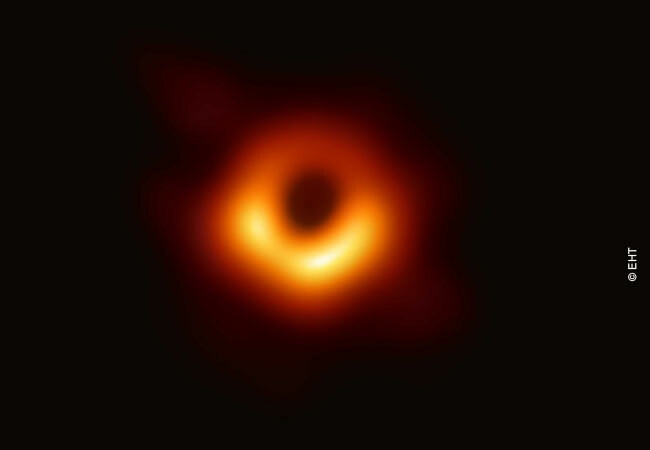 The Black Hole Cam (BHC) Team, led by astrophysicists from Goethe University in Frankfurt, the Max-Planck Institute for Radio Astronomy (MPIfR) in Bonn and the Radboud University in Nijmegen, the Netherlands, are part of this collaboration. Black holes are extraordinary cosmic objects with enormous masses but extremely compact sizes. The presence of these objects affects their environment in extreme ways, warping spacetime and super-heating any surrounding material so that it glows. The theory of general relativity predicts that the heated material will illuminate the extremely warped spacetime, making a dark shadow visible. „If immersed in a bright region, like a disc of glowing gas, we expect a black hole to create a dark region similar to a shadow — something predicted by Einstein’s general relativity that we’ve never seen before,“ explained chair of the EHT Science Council Heino Falcke of Radboud University, the Netherlands. „This shadow, caused by the gravitational bending and capture of light by the event horizon, reveals a lot about the nature of these fascinating objects and allowed us to measure the enormous mass of M87’s black hole.“ The black hole in the centre of M87 has a mass of more than six billion solar masses. The group headed by Luciano Rezzolla made fundamental contributions to the theoretical interpretation of the results throughout each stage of the observations: using supercomputers, they simulated how material revolves around the black hole in a ring-shaped disc (accretion disc) and gets pulled in, and how light rays are bent because of the extreme gravitation around the black hole. It was also important to rule out various alternatives to black holes that are also compatible with the theory of general relativity. “The confrontation of theory with observations is always a dramatic moment for a theoretical physicist. It was a relief and a source of pride to realize that the observations matched our predictions so well,” said Luciano Rezzolla. The first direct image of a black hole required telescopes of unprecedented precision and sensitivity. The realization of this telescope – the Event Horizon Telescope – was a formidable challenge which required upgrading and connecting a worldwide network of eight pre-existing telescopes deployed at a variety of challenging high-altitude sites. These locations included volcanoes in Hawai`i and Mexico, mountains in Arizona and the Spanish Sierra Nevada, the Chilean Atacama Desert, and Antarctica. The EHT observations use a technique called very-long-baseline interferometry (VLBI) which synchronises telescope facilities around the world and exploits the rotation of our planet to form one huge, Earth-size telescope observing at a wavelength of 1.3mm. VLBI allows the EHT to achieve an angular resolution of 20 micro-arcseconds — enough to read a newspaper in New York from a sidewalk café in Berlin. “The 30-m IRAM telescope on Pico Valeta in the Spanish Sierra Nevada is the most sensitive single-dish telescope within the EHT network,” explained Karl Schuster, director of IRAM and member of the EHT board. “Bringing together the best radio telescopes on four continents we can reach an unprecedented sensitivity and spatial resolution, allowing scientists to carry out measurements at the very limit of what is physically possible.” The second IRAM telescope, NOEMA in the French Alps, joined the EHT network in September 2018. The construction of the EHT represents an effort that has spanned many years, and serves as an example of global teamwork by researchers from many countries. Thirteen partner institutions worked together to create the EHT. Key funding was provided by the EU’s European Research Council (ERC), the US National Science Foundation (NSF), and funding agencies in East Asia. „These results mark an important milestone for our understanding of the fundamental processes that determine the formation and evolution of galaxies. It is remarkable that in this project we were able to take our astronomical observations and their theoretical interpretation to the success we hoped for even faster than expected. In the future, scientists far beyond our field will clearly remember a time before and after this discovery,” predicted Anton Zensus, Director at the MPIfR and Chair of the EHT Collaboration Board.